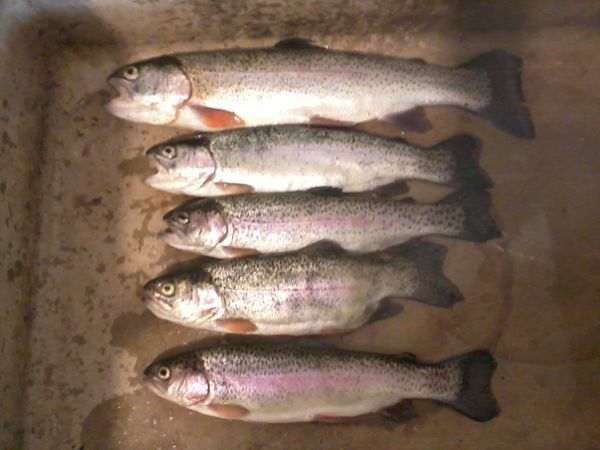 Chicago Fishing Reports | Chicago Fishing Forums • View topic - Nobody told the trout i was back! Nobody told the trout i was back! Went out fishing for the 1st time in over 2 years after my bouts with 2 cancers. So got to the lake and had lines in the water at 9:30. About 10 mins get a hit...ohhh feels good must be a nice trout....Nah 22 inch northern pike. Well it was a nice fish and 1st fish since 2016. nothing going on for 20-30 minutes, must be because the pike was hanging around. Finally get another bite...woohoo trout! Not big but decent eater. Managed to catch 2 more, missed a few bites, had another one shake off 15 feet from shore. Wind is howling...man I'm kinda getting cold. its 12 noon...ok 1 more hour. So times going by I look at the phone its 12:30. Things aren't looking that promising here. I look at my stringer and the 3 trout on it are going crazy!! UH oh the trout are moving in here. Get a bite set the hook man thats a nice one finally #4, Just as I put the stringer in the water ..another hit thats an ok size one...wow thats 5!! No lines in the water...lol. What time is it 12:45! time to go! So the tally was 1@ 10 inches 2 @ 10 1/2 inches 1 @ 11 inches and 1 @ 13 1/4 inches. That's coming back with a vengeance!!!! Happy to see you back at it, even if the fish aren't. That should be a very nice meal. Welcome back. yeah, still got the touch...thanks guys!! Nice job Geo, welcome back! That is a good day! Welcome back. Chitown-Angler was started on February 10, 2003 and has received 207682903 page views in total since that date.